One of 2018's environmental bad guys, plastic waste at sea is attracting lots of attention ... and concern. 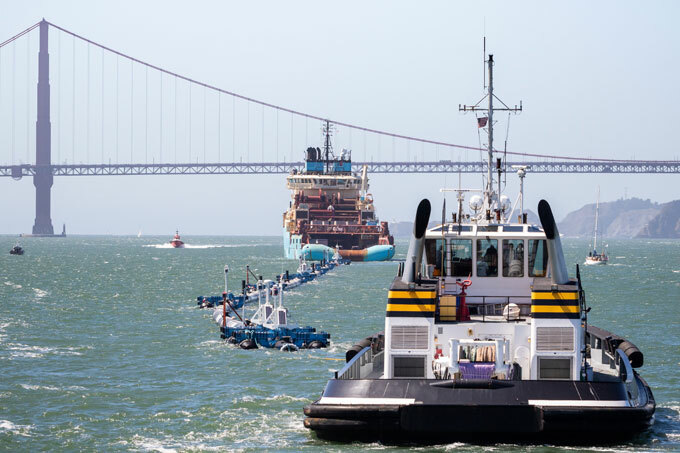 A flotilla of boats recently accompanied the Ocean Cleanup machine out of San Francisco Bay into the Pacific Ocean. Its goal: to make a dent in the Great Pacific Garbage Patch, the giant gyre of floating waste – much of it plastic – churning in the middle of the North Pacific. The Ocean Cleanup machine, basically a long line of giant floating booms linked together, has its work cut out for it: The floating patch is estimated to be hundreds of miles across. But its widely publicized departure offered a hopeful image at the beginning of a herculean effort. ‘Plastics.’ From one-word gag line in 1967 film ‘The Graduate’ to environmental sore spot five decades later. Plastic straws now are seen by many as a symbol of human disregard for the environment, and McDonald’s and other companies say they plan to abandon them. Public figures like actor Javier Bardem are trying to motivate corporations to do more to cut plastic waste, and Pope Francis has lamented the way humans and modern civilization have transformed oceans to dumps for discarded plastic. The solution to our plastic woes? Well, we could begin by making less of it, Emily Jeffers of the Center for Biological Diversity and others advise. Manufacture of plastic products in mass quantities began about 70 years ago, and humans now make about 381 million metric tons of it a year – a number that’s projected to double by 2040. Amid all the unsettling news about how plastic degrades into tiny microscopic bits and gets into the fish we eat and the water we drink, one study from the University of Hawaii at Manoa really stuck out for people who follow climate change news. It found that plastics emit greenhouse gases as they degrade in sunlight – in particular methane and ethylene. That’s no great surprise given that plastic is derived from fossil fuels. But it’s worth noting that methane is roughly 30 times more potent a heat-trapping gas than carbon dioxide. The University of Hawaii researchers tested seven types of plastics as they degraded: polyethylene terephthalate, polycarbonate, high-density polyethylene and low-density polyethylene, acrylic, polypropylene, and polystyrene. “All gave off methane and ethylene in the days after being exposed to sunlight, they found, but polyethylene, which is used to make plastic bags, was the worst offender,” The Scientist reported. So, what is the overall carbon footprint of humans’ rising appetite for plastic, at least in the U.S.? At least one study, led by researchers at Carnegie Mellon University, pegs it at 1 percent of overall U.S. emissions (U.S. emissions totaled about 6.5 billion metric tons in 2016, according to EPA). Just making plastic products, meanwhile, accounts for nearly 3 percent of total U.S. energy consumption, according to the Carnegie Mellon study. Those researchers compared two strategies for lowering emissions from the plastics industry: switching to renewable energy in the production of plastics, and switching to corn-based biopolymers as a raw material for plastic. They concluded that switching to renewable energy – even while leaving manufacturing processes the same – would yield the most benefits, at least for now. Switching to renewable energy could cut industry emissions by 50 percent to 75 percent – a mean industry-wide reduction of 38 million metric tons of CO2 equivalent (CO2e) annually. Switching raw materials would cut emissions by 25 percent. In the long run, the researchers noted, a combination of both could cut the most carbon emissions. A separate 2016 study had shed some light on where carbon emissions are generated over the lifetime of plastic products. Authors of that study specifically examined the carbon footprint of the manufacture of plastic trays – the kind used in packaging food. In sum, they found that the “cradle to grave” carbon footprint of one kilogram of polyethylene terephthalate trays – even those made with 85 percent recycled content – is 1.538 kg CO2e. In other words, their carbon footprint exceeds 150 percent of their original weight. Recycling does have a big impact: the researchers found that a 24 percent decrease in the carbon footprint of trays could be achieved if trays were manufactured with 100-percent recycled content rather than with the current 85 percent. Making trays lighter had a similar impact. Improving the efficiency of transporting the products, by contrast, would have a relatively minor impact. There are a few take-home messages from this short look at the climate impact of plastics: First, they’re not going away, and humans’ and civilization’s demand for plastic products is only going up. Second, the best hope for reducing the carbon footprint of plastics, at least in the near-term, is to make plastic products with renewable energy. And third: recycle, recycle, recycle. More on the PLOS ONE study that degrading plastics emit greenhouse gases. The conflict of interest that is killing recycling Some of the biggest recycling operations are owned by landfill companies whose profits improve when recycling doesn’t work well.